300.00 up to 3 hours hire including fully uniformed chauffeur . 1920's Style Open Top Beauford Tourer( Bentley replica). This car will accommodate the grandest of wedding gowns. One of our most popular Wedding Cars. The British built. Our version has been finished in White. The vehicle has been fully restored In & Out and looks like brand new. Interior white leather & fur . Regent Convertible are the Ultimate in Style. 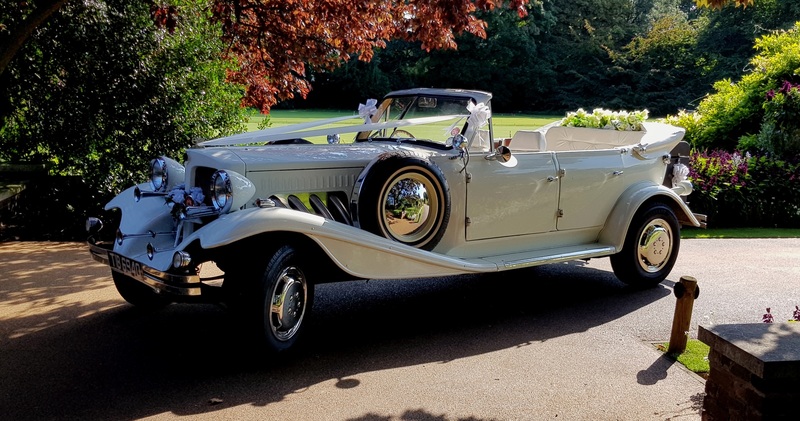 The Beauford Tourer car comes complete with a fully uniformed professional chauffeur, large umbrellas, flowers, ribbons and bows. A truly stunning car - the perfect way to begin your journey to married life. 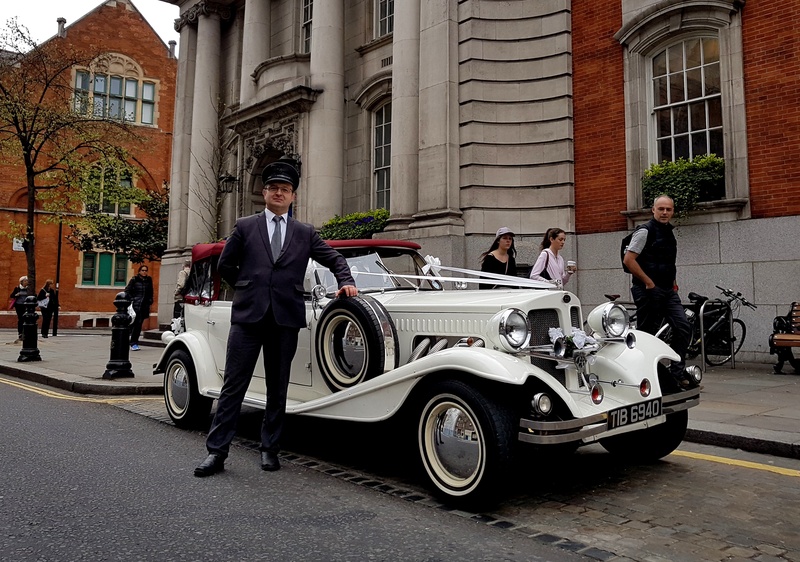 Magic London Tours Wedding Cars- a family run business established in 2007. 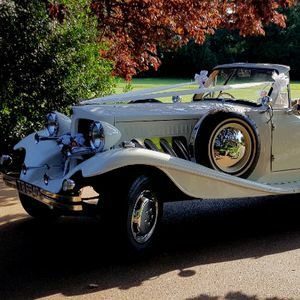 Here you will find a selection of some of the finest classic cars for your special day . The focus of the company’s owner and founder, Roland Ches, has always been the customer; fulfilling their personal requirements with the best quality we can deliver. Your Wedding Day is a memorable occasion and event that is unique and special to you. 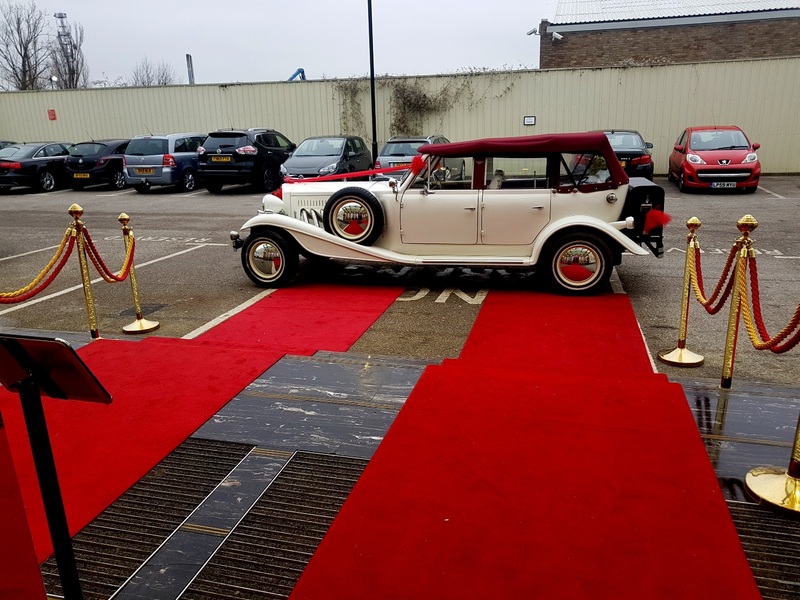 Our luxury classic cars, driven by our experienced, qualified and professional smartly uniformed chauffeurs will make a lasting impression whenever you wish to arrive in style. You will not have to worry about a thing on your big day. All our wedding cars are immaculately presented, complete with appropriate ribbons and a beautiful, tasteful floral display on the rear parcel shelf. Each wedding is individually quoted at our most competitive rates and the vehicle/s of your choice will be secured with a small holding deposit. If you would like to view our vehicles in person, please contact us for an appointment. Let us make your Wedding Day as special and unique as you deserve! 1.Classic Wedding Car ( Bentley replica). 2.Chrysler C300 Black/White Wedding Car 3. Mercedes S class . per hour. Minimum 3 hours. Classic Wedding Car. Decorations. Fully uniformed chauffeur.